I love traveling. There's something about the freedom of being in a car, just taking off and driving - seeing Mother Nature! However, travel is a bit different with kids. They don't always appreciate God's creations the same way that I do. They also "feel the call of nature" more often than I do. 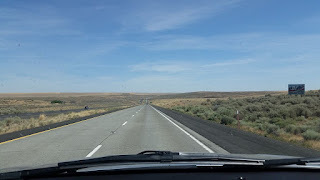 This made for an interesting day of travel through the sparsely populated areas of eastern Washington. The first true problem I had to deal with on this road travel was that I had a VERY newly potty trained child. Granted, I decided he would wear pull ups during this road trip, but it was still an issue. When he said he had to go, we stopped. But, where do you stop when there are no towns or rest areas in sight? Well, I learned how to teach a child to pee on the side of the road. With a husband half a world away, this had to have been humorous for the few people that passed us, as I had no clue how to teach a boy to pee standing up. With this problem dealt with, we continued on our journey. Needing a good place to stop for lunch and respite, what better place could we choose than the place where Macklemore and Ryan Lewis chose to film their music video, Downtown?! Spokane offers numerous dining, shopping and extracurricular options. Whether you want to spend a day or a week exploring this charming town and it's surroundings, you'll have a great time. Since we were still at the beginning of our road trip and trying to maintain several more hours of driving, the kids and I made just a brief stop in Spokane for lunch at Riverfront Park. This beautiful downtown park sits right along the Spokane River and provided us time to catch up with my good friend Jackie, fill our bellies, and move our legs. There are walking trails where you can view the stunning Spokane Falls. 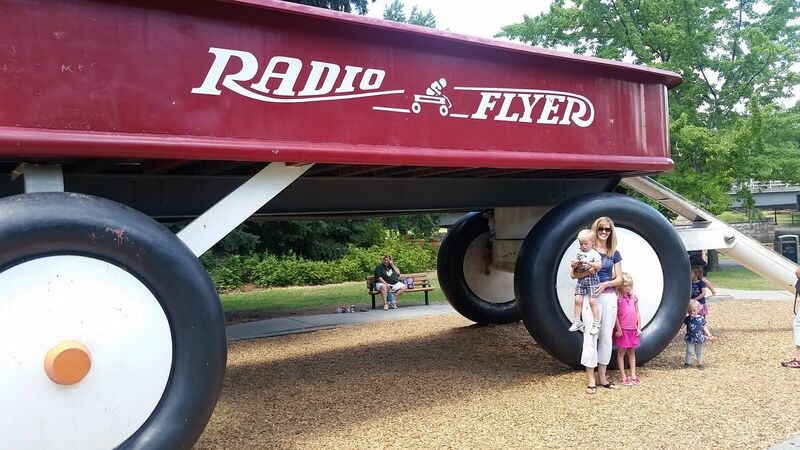 At the center of the park is the Big Red Wagon, commissioned by the Junior League of Spokane and dedicated (according to their plaque)"to Spokane's children, as a reflection of the past, created in the present, to last into the future." This structure was so much fun to watch children and families of all ages and sizes run, jump, climb and hang from. It provided much needed exercise so that we could continue our travels on to Missoula, MT on this hot, summer day. My family and I were blessed to spend some time here. If you happen to be driving through eastern Washington with kids, this is a stop you can't miss! **If you are a woman seeking to make lasting impact in your community, I encourage you to check out your local Junior League. It is through this organization that I have made lasting friendships with women who are dedicated to improve their communities in numerous different areas; such as, foster programs, stopping human trafficking, domestic violence, cyberbullying, STEM education, childhood nutrition and fitness, literacy, and so much more. As a Junior League member, you become a trained volunteer - learning to be a leader in civic and nonprofit areas.